Love, love, love how you make good use of one purchase Sandy! This is just such a genius idea. Thanks for sharing with us. 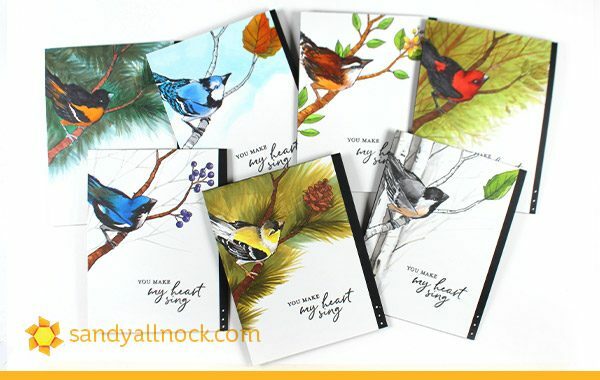 You are just amazing Sandy – these birds and the cards are fantastic! I LOVE Aves!!! Thanks so much for this GORGEOUS artwork!!! At first I thought this was a stamp set with seven different birds. Oh my I love how you colored this one bird so many different ways. One of my favorite of your artworks! Beautiful!! I love this idea, but have a hard time getting down that path, so I’m glad you gave the shove to start. They are absolutely amazing. Thank you for sharing your talent with us!! The cards are so beautiful! Thanks for the reminder to think about the versatility of our stamp sets. Since I began reading your blog, I’ve begun to think outside the box a little more. Wow, Sandy! What beautiful artwork! I love the beautiful birds, and you shared a great idea! Thank you, my favorite artist! I love these! I have really taken an interest in feeding, watching, and photographing our backyard birds this year. They have been coming in droves, especially when it is icy cold outside. We only have a couple that you painted (chickadees & bluejays), but lately we also often have sparrows, black-eyed juncos, European starlings, cardinals, red-breasted nuthatches, and a female red-bellied woodpecker. 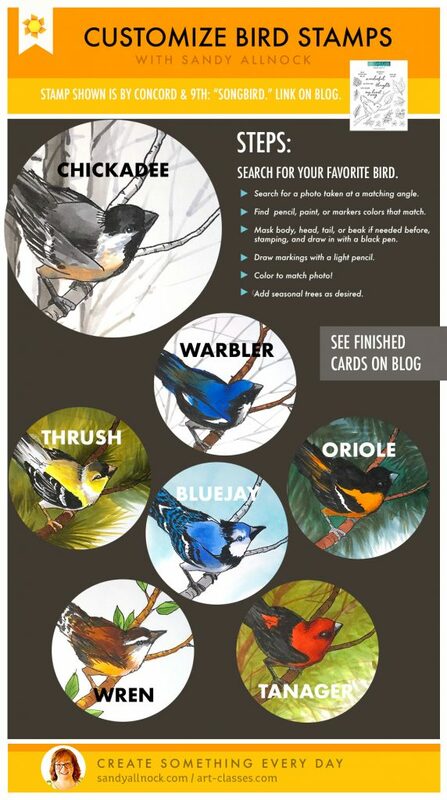 I would like to request a bird card part two post when you are in the mood to paint birds again! Thanks for sharing your beautiful art and amazing talent! This is a fab idea for an animal that has so many varieties. It’s great to see the different styles from the same stamp. Thanks for sharing your creativity. Your coloring is always so beautiful Sandy. One can tell you’ve spent a long time honing your talents. Thanks for sharing with us. Ooooohhhhhhh Sandy, I love the different renditions from a single stamp! 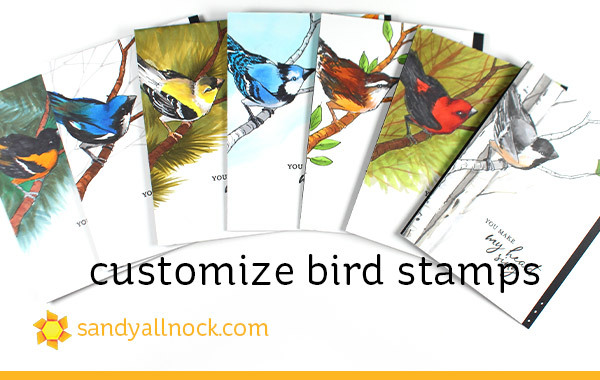 They all turned out beautifully and the backgrounds enhance each birds coloring. Thank you for the inspiration and sharing your talents with us. These are incredibly colored. What a genius idea Sandy. I would never had guessed they all began as the same stamp if I hadn’t seen it with my own eyes. Wow this is great Sandy.I have put the image on my Pinterest page so I always can find it when I need it. Thank you so much for this great lesson. The cards you made with the awesome birds are stunning! These are gorgeous, and such a good idea to get multiple birds out of one stamp. You are truly a talented artist. These are gorgeous! I am jealous of your skills!